Making delicious artisan-style sourdough bread doesn’t have to be rocket-science. Let us demystify the art of making beautiful and rustic sourdough bread. I’ve been making sourdough bread for nearly five years (and subsequently sourdough EVERYTHING else). But out of every sourdough recipe I’ve ever made, this may just be my favorite. This artisan loaf is the kind of bread you’d get at a nice restaurant, served piping hot, brought out in a towel wrapped basket…just waiting to be slathered with butter! If you’ve dabbled in sourdough at all, you know the addiction is real. And I have zero guilt about getting others hooked! In fact, I want so many of you to be addicted to baking with sourdough that I wrote an eBook full of sourdough recipes! If you’re a lover of all things sourdough, then hop on over and check out our eBook Everyday Sourdough: Easy Recipes for the Everyday Baker. New to sourdough? Looking for easy and delicious recipes (including gluten-free options!)? Grab our eBook and click here for some samplings of what’s inside! If you’re a home baker and have tried sourdough before, you know making a quality loaf of bread (that’s also beautiful) can be like trying to jump up and touch the stars. At first! A perfect loaf of sourdough bread isn’t likely achieved your first try. You won’t just read a recipe, look at a few photos, or watch a few videos and be a pro. You’ve gotta get your hands dirty (or doughy) and learn the way sourdough works. There’s a certain feel when it’s properly proofed and stretched. It may even take you a few rounds until you get a loaf that resembles bread and not a hockey puck. But stick with it, it’s worth it. You learn best by doing (and doing, and doing, and doing). And once you’ve mastered your perfect loaf, TAKE A PICTURE! You’re likely to still encounter flops every now and again. The good news is, terrible looking bread still tastes incredible! And when in doubt…make French toast! Sourdough bread is a completely different animal than bread that starts with commercial yeast. Unlike commercial yeast, which has been engineered to only contain the strains of yeast that grow the fastest, sourdough is a combination of bacteria and yeast that naturally occur in the environment. 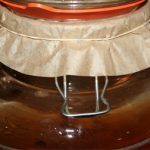 This means those with sensitivities to commercial, store-bought yeast, oftentimes can tolerate wild yeast with no problems. Yes, wild yeast takes much longer to cause your bread (or baked good) to rise, but because of this long, slow rise, or fermentation period, you’ll be rewarded with bread that’s soft, chewy with a complex, tangy flavor. This incredible texture and flavor are all thanks to the bacteria (or lactobacilli and acetobacillus) which grow alongside the wild yeast in the sourdough culture. As the dough ferments, these bacteria pre-digest the flour and ferment the sugars in the dough, creating natural carbon dioxide. As the carbon dioxide tries to escape from the dough, the gluten (which has been properly activated during the autolyse and by stretching and folding) expands and captures this gas, causing wonderful holes (aka crumb). If proper crumb is achieved, this is a bakers dream come true when they first slice into their cooled loaf of bread. As hard as it may be, it’s NEVER recommended to slice into a hot loaf of sourdough bread. The steam will escape and you’ll be left with a gummy, deflated loaf. Trust me, it’s worth the wait! As mentioned above, traditionally prepared sourdough has a slow-rise time. This slow-rise allows for the grains to be properly broken down, neutralizing the harmful anti-nutrients, so our bodies can digest them easily without causing gut issues. But don’t let the time scare you away, the hands on time is probably less than most yeasted quick breads, it just takes a little more planning ahead for that fresh warm loaf of bread. Be sure to read the additional sourdough tips and tricks at the bottom of this post! This artisan sourdough boule is the perfect balance between a subtle and pronounced sour “tang”. There are a few tricks I’ll share for getting more or less tang to your bread, depending on your preference. But this recipe is slightly sour with the perfect counterbalance of sweet and yeasty flavors. It’s important to start this recipe with an active (and established) sourdough starter. This simply means, don’t try and bake this loaf of bread with your brand new starter. Wait until it’s had a solid four weeks of consistent feedings (and doubles in size) before having a go at this sourdough boule. Now, assuming your starter is nice and active, you’re going to create a leaven (or levain) by mixing together 1 Tablespoon of active starter, 1/3 cup room temperature water and 1/2 cup flour. Mix this together in a pint size jar, lightly cover with a lid and leave at room temperature overnight (or 8-12 hours). I like to do this the night before…the next morning the leaven is nice and bubbly with a heavenly yeasty aroma. Dissolve 1 Tablespoon salt into 1/4 cup room temperature water. Set aside. If you’re anything like me, you might be confused by this step. When I first heard about omitting the salt until AFTER the autolyse stage (the next step) I was puzzled…it seemed a foolish and unnecessary step, but trust me, it’s important! 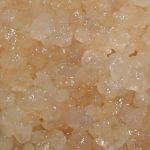 Salt has the capability of limiting activity during the autolyse stage, so waiting to add the salt can increase the gluten formation and carbon dioxide production in your loaf (both very important things…trust me!). The reason we mix it with water is so we get it evenly distributed into the leaven after the next step. So just mix together your salt (I used pink Himalayan) and water and set it aside until later. To make sure your leaven is active and strong, measure out 2 1/4 cups filtered water into a large bowl. Take a teaspoon of your leaven and drop it in the water. Pretty much a fancy name for letting your flour hydrate before starting the kneading process. Once you’ve mixed your leaven with the remaining flour and water, cover it and let it sit for 30 minutes to “do it’s thing”. Your arms will thank you for making time for this step! You can leave your dough to autolyse for up to 4 hours. So figure out what works for your day and go with it! I’ve both let my dough rest for 30 minutes, 4 hours, and pretty much everywhere in between! While the dough is resting, the flour absorbs the water and fully hydrates. This allows the enzymes to start breaking down the starches in the flour into simple sugars. It’s these simple sugars that feed the bacteria and yeast, which in turn create the acid that produces that classic sourdough tang. This step also “preps” the gluten for the next step where we’ll work on the formation of the gluten. So just mix together your leaven, flour and water, cover and let it rest for 30 minutes (or up to 4 hours). Salt is necessary for giving your bread flavor. Without it, you’ll be left with a bland, tasteless bread (trust me, I forgot to add it once!). Now that your dough has gone through the autolyse stage, mix in the salt water. Give your water one last swirl (this is necessary if you use a sea salt high in minerals as they tend to settle on the bottom) and pour over the dough. Continue mixing until all the water is absorbed and your dough is nice and sticky. Now begins the “stretch and fold” method of developing the gluten in your dough. 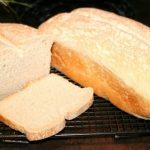 This is a super simple method that allows the gluten in your bread to form, yet is gentle enough that it doesn’t deflate any carbon dioxide that’s created throughout the process (otherwise known as “de-gassing”). De-gassing is a no-no in the sourdough world as it’s this gas that creates the beautiful crumb and airy texture with a nice network of holes. Stretch and fold every 30 minutes for 2 1/2 hours (150 minutes, or a total of 5 stretch and folds). Look at your bowl as an analog clock. Starting at 12 o’clock, grab your dough and stretch it up then fold it down toward 6 o’clock. Next grab your dough at 3 o’clock and stretch it up and over toward 9 o’clock. Then grab your dough at 6 o’clock and stretch it up and over toward 12 o’clock. Last, grab your dough at 9 o’clock and stretch it up and over to 3 o’clock. Cover the dough and let rest 30 minutes. Repeat every 30 minutes for 2 1/2 hours. 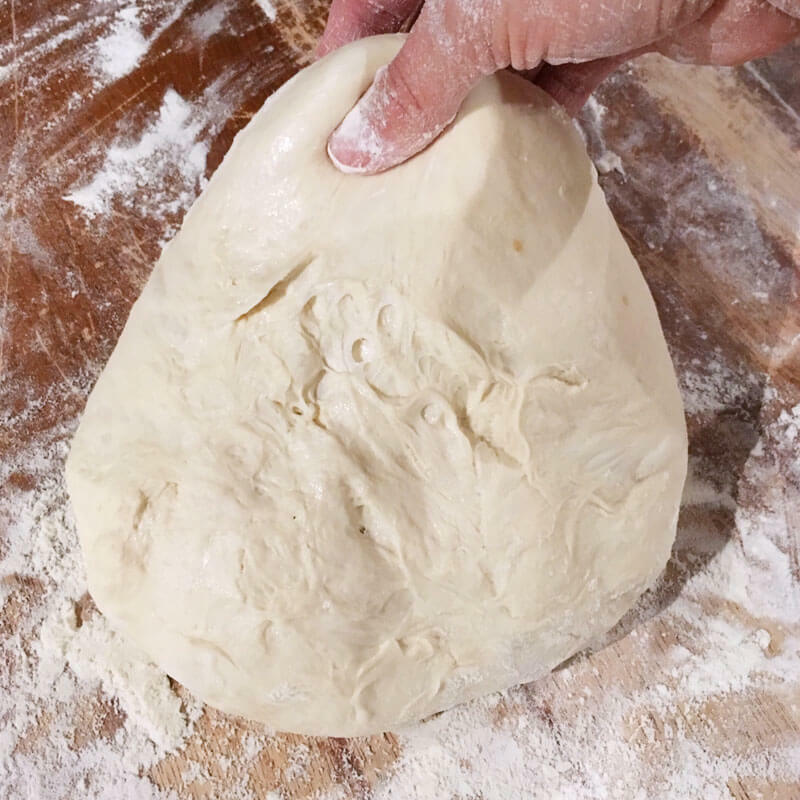 Your dough will begin somewhat sticky and pretty stiff, but after each additional stretch and fold you’ll notice it getting smoother and more elastic. Once you’ve done the final stretch and fold, while your dough is resting for the final 30 minutes, you’ll want to prep your baskets or bowls for proofing. Many bakers prefer to use banneton proofing baskets which impart a beautiful texture to the dough that remains after baking. These baskets aren’t mandatory to make a sourdough boule, but they can come in handy. Whichever method you prefer, we need to prep them for the dough. My best tip is to invest in a bag of rice flour. You’re going to want to flour the surface of your towel (or banneton cloth) so your dough doesn’t stick while proofing. Rice flour is wonderful because it has a very fine texture and prevents sticking better than all purpose flour, or other more coarse flours. If using rice flour, you won’t need as much, however you’re going to want to coat the towel completely and spread it all around with your hands. If using all purpose flour, add more flour than you think you need. It’s better to have more than end up with dough stuck to your towel. A tea towel is a good choice for lining your bowl as they’re a lighter fabric without texture. However, if you choose a towel that has texture, just know it will transfer to the surface of your dough. I have seen some bakers get really fancy with their towels, creating some really pretty final loaves of bread. One of the benefits of using a proofing basket is that they’re very low maintenance. Once you’re done proofing your bread, knock out any excess flour and let them air dry. Then store them away in a cupboard or pantry. If you handle them properly, the towel shouldn’t need to be washed after each use (and allowing the flour to build up will make proofing easier each time). Just be sure to only store them once completely dry, and keep an eye out for signs of mold. Once your bowls or baskets are prepped, set them aside until after the final shaping of your boule. This recipe makes two, medium-large sized boules. So you’ll need to divide your dough into two portions. 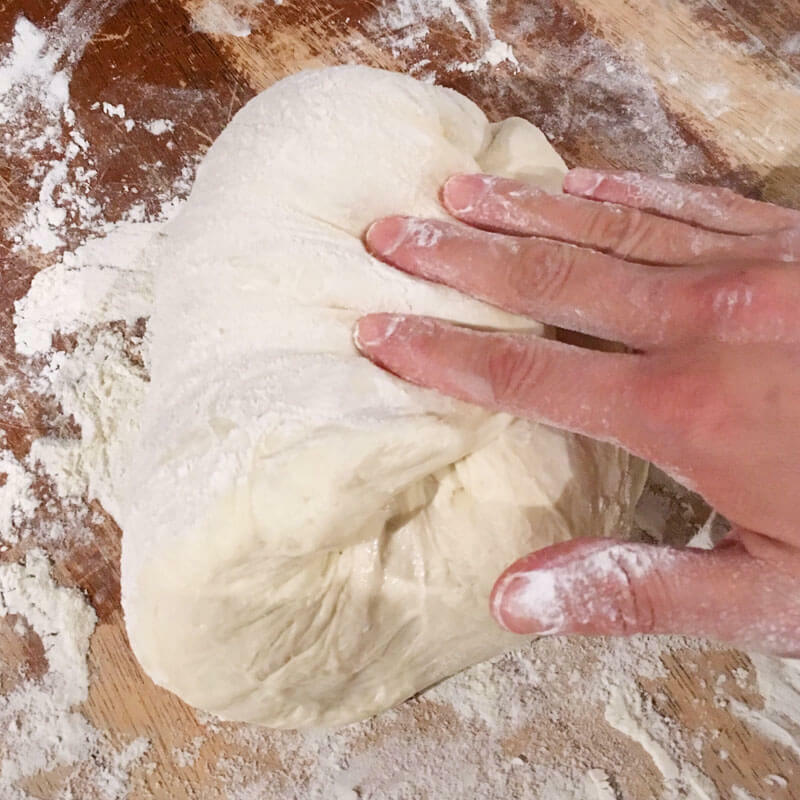 To do this, lightly flour a work surface and carefully pour out your dough. Be gentle as you don’t want to pop those precious bubbles and deflate your dough. 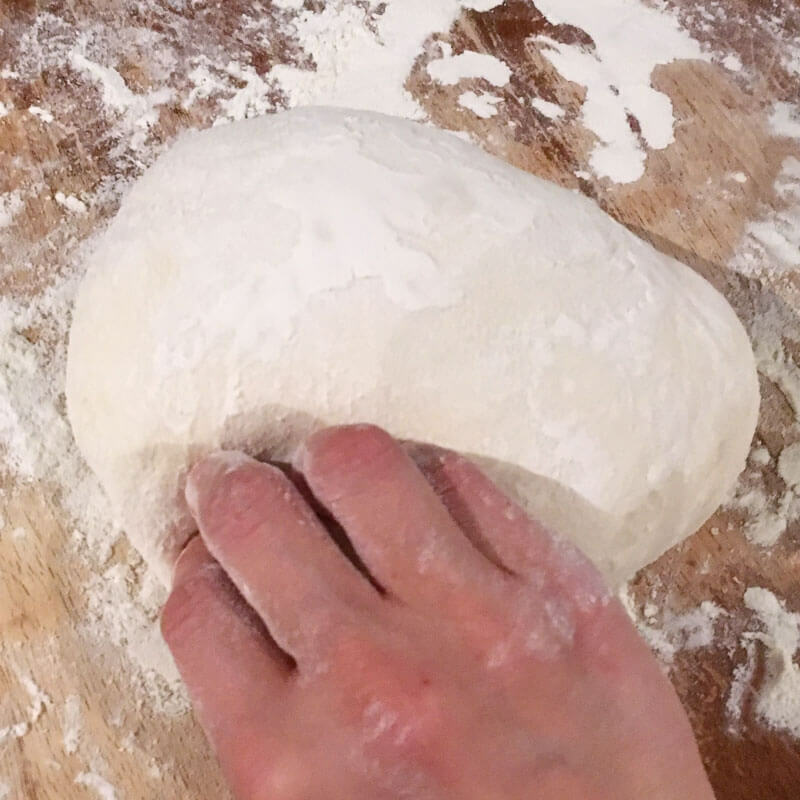 Use a sharp knife or pastry scraper to divide your dough in two. 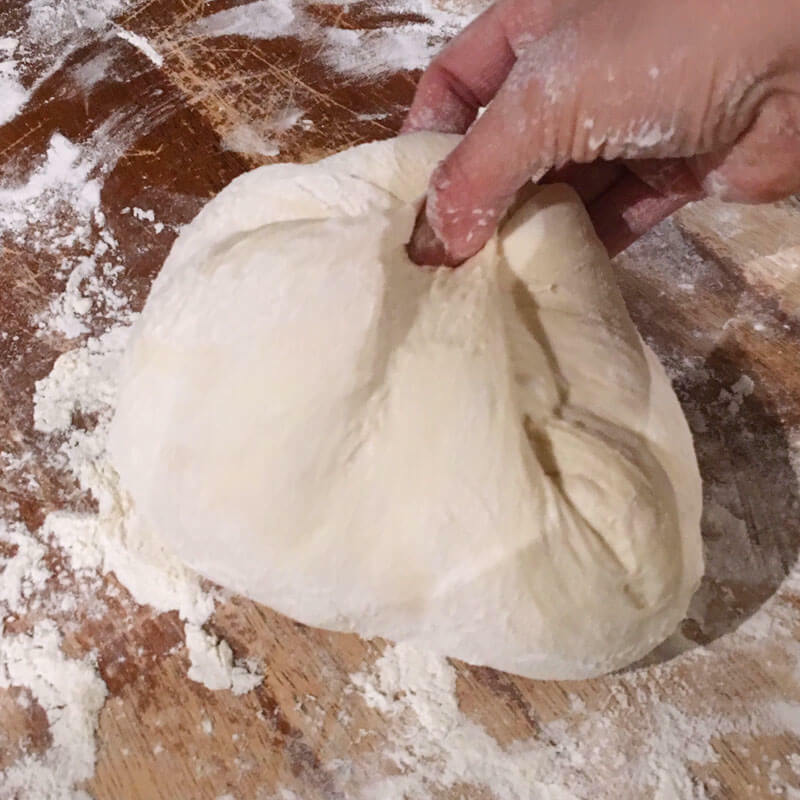 Shape each half of dough into a loose round ball. Using your pastry scraper and your hands, work around the base of the dough to create some surface tension. Continue turning and tightening your dough into a nice, even ball. Some describe the motion of this as pressing your pastry scraper under your dough at 3 o’clock and pushing to create a somewhat log shape, then turning the pastry scraper along the table like a steering wheel counter clockwise to 11 o’clock. Don’t get too hung up on this step, but a nice tight ball will create a taller loaf in the end. There will be a final shaping of your dough, so don’t worry about getting it too perfect at this point. Loosely shape both loaves of dough and let them rest on your work surface for 20 minutes. 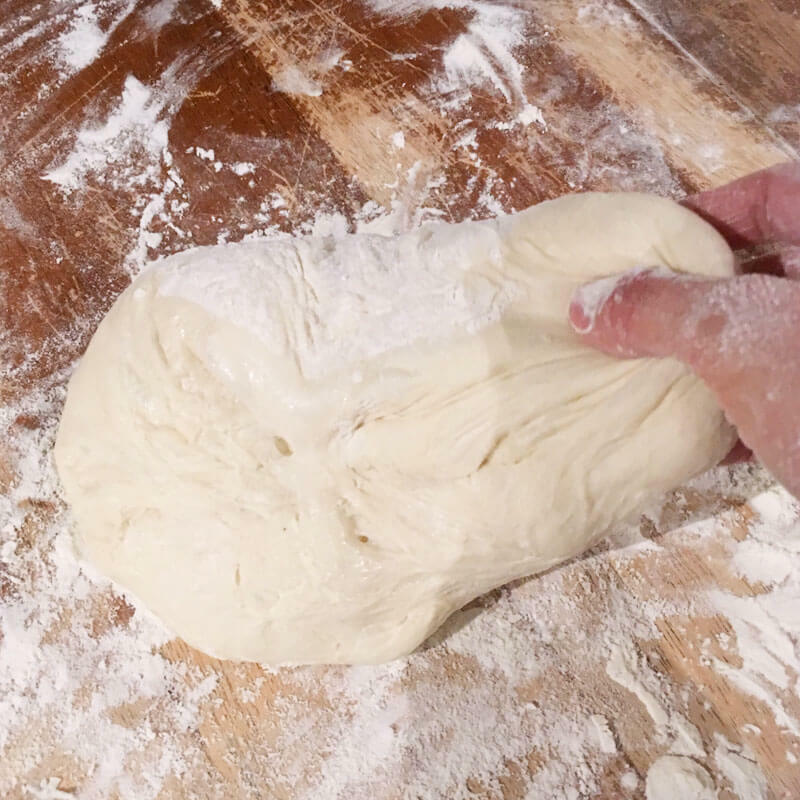 Sprinkle the tops of your dough with a little flour and, working with one loaf at a time, flip it over so the smooth side is down (seam side up). Now we’re going to do four final folds to create a nice, tight ball of dough. Carefully grab your dough at 12 o’clock and pull down toward the center of the “clock” (your dough). Next, grab your dough at 3 o’clock and pull toward the center of your dough. Next, grab your dough at 9 o’clock and pull toward the center of your dough. And last, grab your dough at 6 o’clock and pull toward the center of your dough. As you do this, grab your dough at 12 o’clock and flip your dough over so the seams are facing down and the smooth top is up. Use your hands to smooth out any edges to create a nice round ball. Flour your hands well and carefully transfer each round of dough to the prepared proofing bannatons or towel lined bowls. Working carefully (protect those precious bubbles! ), place them upside down in your bowl, seam side up. Now it’s time to let the dough have a final rise. We’ve stretched it, worked it, folded it, shaped it and now it gets to rest and do it’s thing. There are a couple options for this final rise. Typically, a simple 3-4 hour rise at room temperature will do. However, my preferred method is to let it do a longer, slower, cold-ferment overnight in the refrigerator. If you like a less sour loaf of bread, then do the shorter 3-4 hour rise. If you’d like your bread to have more of that distinctive sourdough tang, go for the overnight proofing in the refrigerator. Whichever method you’re using, grab a plastic bag (a large grocery bag or even a trash bag will do, it won’t be touching your bread). Place your baskets or bowls inside the plastic bags and twist the end to create a seal. 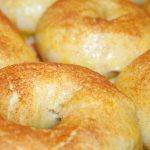 Leave them on the counter for 3-4 hours, or clear out some space in your refrigerator and let them proof overnight (or up to 18 hours). How do I get a more sour sourdough bread? The longer you let your dough rise, the more sour your end result will be. This is because of the lactic and acetic acid that’s produced from the bacteria in the starter. The vinegar-like acetic acid is what gives sourdough it’s familiar tang. By creating a longer rise/proofing time, the acetic acid-producing organisms will thrive, multiply and create a tangier end result. What’s the best way to bake your sourdough bread? When it comes to baking a rustic, artisan sourdough boule, one of your main goals is a nice, crispy (yet chewy) crust. There is some discrepancies over what merits a beautiful crust, but my opinion is, if it’s how you like it, then it’s a win! The way to get a nice, chewy crust is to create steam. In order to create steam, you need high heat to cause the water in your dough to steam. And in order to trap the steam, you need to bake your loaf in a Dutch oven, a covered pot, or on a stone with a pot flipped on top to trap the steam. Don’t feel the need to run out and buy the most beautiful dutch oven you can find (although if you want to become an avid baker, they’re certainly handy! ), look around your home, be creative and see what you can come up with. I only have one cast iron Dutch oven (which I love), but I use a medium sized stainless steel pot with lid for my second loaf which produces a nice tall loaf, perfect for hollowing out and filling with hot crab dip! Once your bread has risen and you’re ready to bake, preheat your oven to 500 degrees F. Place your pots (and lids) into the oven to heat up as well. Once your oven is preheated, get your dough ready to transfer by removing them from the bag. Carefully remove your pots (one at a time) and, working very carefully to avoid burns, dump your dough, seam side down, into the hot pot. If your dough sticks at all, carefully pull it away from the towel, pinching to seal any tears that may occur. Using a sharp knife or dough lame, score the top of your loaf with your preferred design (and keep experimenting with scoring until you find your favorite look!). A sharp knife gets the job done, but having a scoring lame comes in very handy (plus they’re inexpensive!). 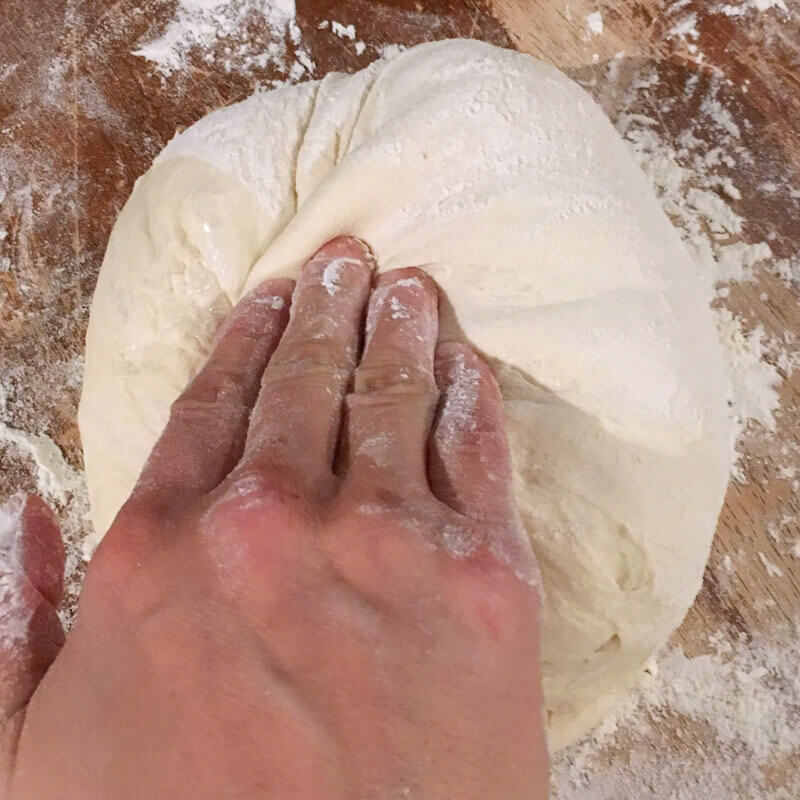 If you’re able, try scoring your dough at a 45 degree angle. This will give you more chances of creating an “ear”. There’s no real benefit to creating an ear, other than it kinda looks cool once your loaf is done baking! Some bakers work a long time to get their perfect ear! Once your dough is scored, place the lid on the pot and put the pot into the oven to bake for 20 minutes at 500 degrees F.
After a total of 30 minutes bake time, remove the lid and continue baking at 450 degrees F for 15-25 minutes, or until desired color is obtained. Your loaf may look lightly golden-brown when you remove the lid after the initial 30 minutes, but don’t be fooled, your loaf isn’t done baking. If you take it out now, you’ll be disappointed with the final texture of the bread. Once your bread has baked an additional 15-25 minutes (and your desired color is obtained), remove it from the oven and flip it out of the pot onto a cooling rack. There’s no hard-fast rule that says your bread HAS to come out of the oven! If your crust isn’t as dark as you like it, leave it in an extra 5-10 minutes! Let your bread cool completely before slicing! This is perhaps the most difficult part! Who doesn’t love a nice warm piece of sourdough bread slathered in butter? But if you cut into your bread now, the steam will be released, your bread will not finish baking (it actually finished its cooking process on your counter!) and you’ll be left with a gummy texture and a bread that won’t hold it’s shape while slicing. But if you don’t care about such things, then by all means, DIG IN! Making delicious artisan-style sourdough bread doesn’t have to be rocket-science. Let us demystify the art of making beautiful and rustic sourdough bread with this recipe for a simple artisan sourdough boule. On the evening of day one, mix together 1 Tablespoon active sourdough starter with 1/3 cup room temperature water. Stir to combine, then mix in 1/2 cup flour. On the morning of day two, dissolve 1 Tablespoon sea salt into 1/4 cup filtered water. Set aside. Add leaven to bowl of water and stir to combine. Add flour, stirring in one cup at a time, until all flour is incorporated and no dry flour remains. Cover bowl and allow to rest (autolyse) for 30 minutes (or up to 4 hours). Give salt water a final stir to be sure all salt is dissolved. 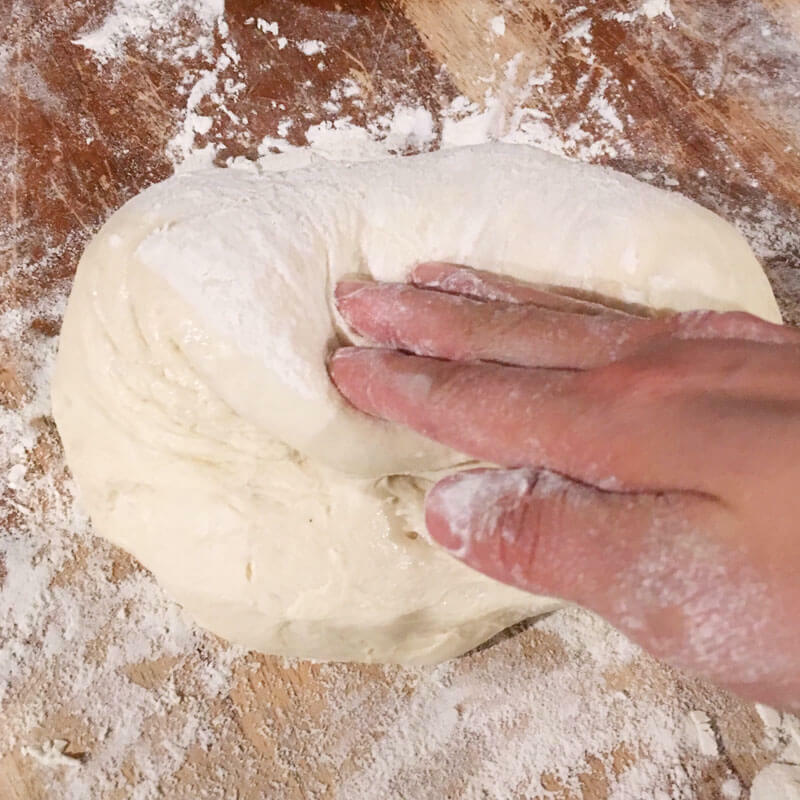 Using your hands, mix salt water into your dough. Stretching and folding until all water is incorporated. Set a timer for 30 minutes. When timer goes off, stretch and fold the dough four times. Stretching from 12 o’clock down to 6 o’clock. 3 o’clock over to 9 o’clock, 6 o’clock up to 12 o’clock and finally 9 o’clock over to 3 o’clock. Cover the dough and let rest another 30 minutes. Continue steps 9 & 10 for 2 1/2 hours, or a total of 5 stretch and fold sessions. Let your dough rest, covered, while you prepare your bannetons or towel-lined bowls. Dust your banneton liners or towels generously with rice flour and set aside. Carefully pour out your dough onto a well floured work surface. Divide your dough into two equal portions. 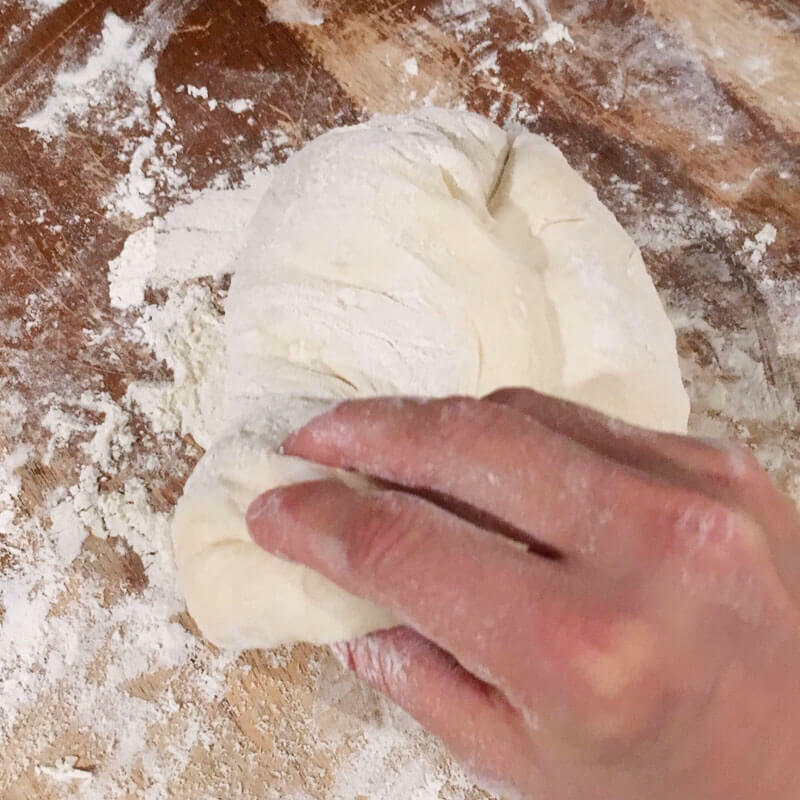 Working with one dough at a time, take a pastry cutter, scoop up under your dough and shape into a loose ball with your hands (see photos). Again, working with one dough at a time, dust the top with a little flour and turn over so the top is now facing down. Grab the dough at 12 o’clock and stretch and fold into the center of the dough. Work your way around the dough, stretching and folding at 3 o’clock, then 9 o’clock and finally 6 o’clock. Once you grab the dough at 6 o’clock, pull toward the center and grab 12 o’clock to flip the dough back over so the seam side is now down. 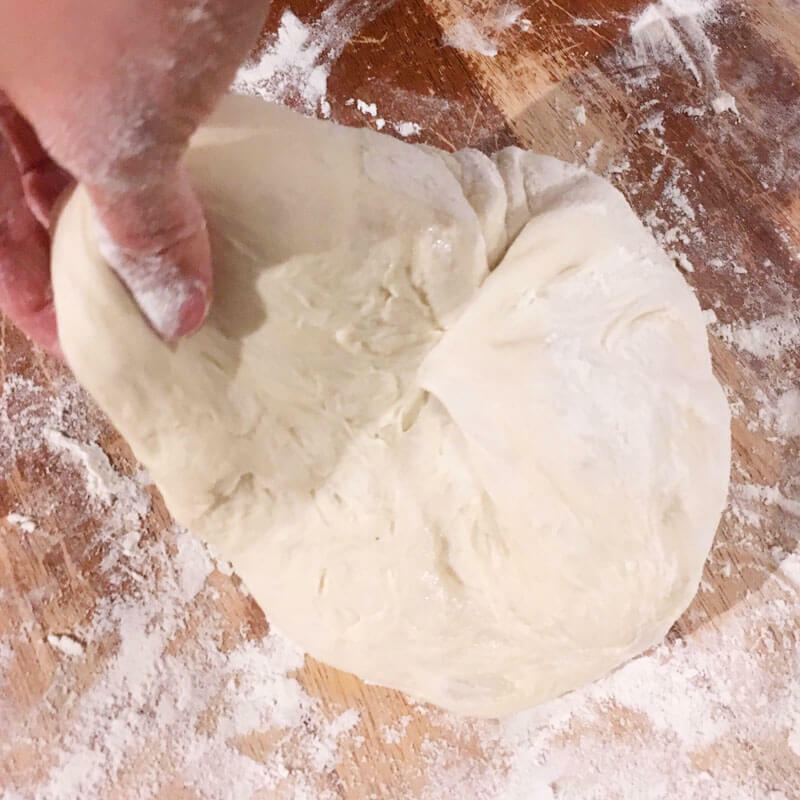 Lightly re-shape your dough to get a circle, if needed. 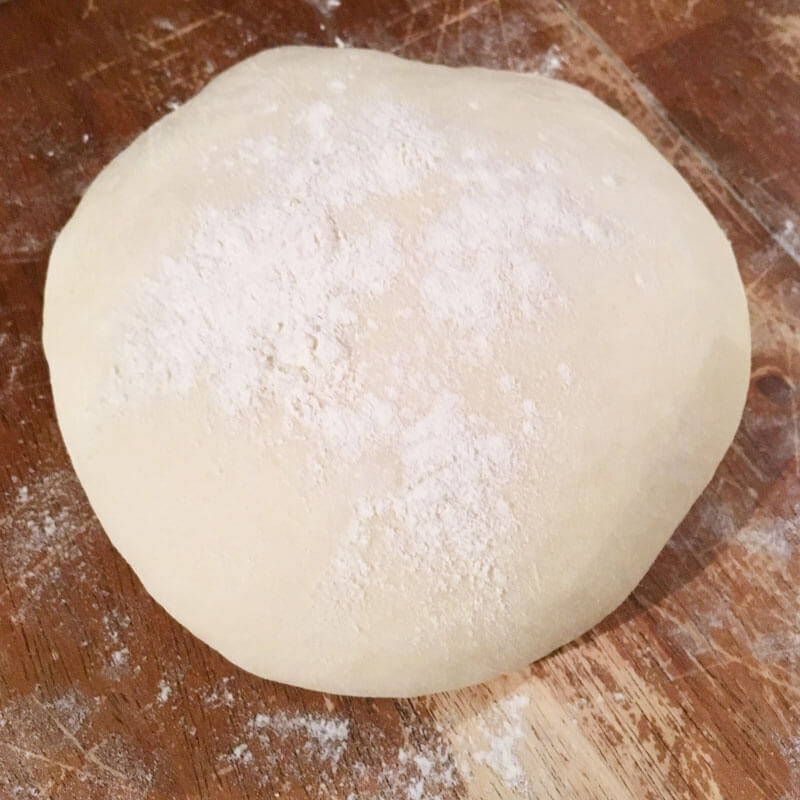 Transfer each ball of dough to a proofing basket, placing the top down and the seam-side up. Wrap your baskets in plastic and let rise for 3-4 hours, or place in the refrigerator for 12-18 hours. Once your dough has risen (whether on the counter or in the fridge) and you’re ready to bake, place your Dutch ovens (or other baking options) in the oven and preheat to 500 degrees F.
Take your dough lame, or a sharp knife, and quickly score your dough, keeping at 45 degree angle, if possible (don’t burn yourself in order to achieve this angle!). Put the lid on the pot and place into the oven, repeat with other loaf and bake at 500 degrees for 20 minutes. Reduce the oven temp to 450 degrees F and bake for another 10 minutes. Remove the lids off your Dutch ovens (or pots) and continue baking for an additional 15-25 minutes until crust is golden brown, or to your preference. Lift bread out of pots using a spatula and allow to cool completely on a cooling rack. Once bread is completely cooled off, slice that baby open and enjoy your reward! Click or tap on image to open gallery. There are a few pointers that’ll come in real handy when working with sourdough, and if you team up with other sourdough lovers, there’s so much you can learn from each other (especially each other’s mistakes!). One of the best tips I can give is to watch and learn. Watch someone make a loaf of bread, join them in their kitchen, get them to let you feel the dough and see the magic as flour, water and salt turn into something magical! A starter is 1000 times more resilient than you realize and can be managed and changed in a myriad of ways to meet your needs. A starter’s performance is the best predictor of your dough’s performance. If it doesn’t double (and it’s not too wet), neither will your dough. The rules for a new starter are very different than those for an established starter. Not all starters are the same – while beginning one from scratch has value – try one with some history behind it just to know the difference. What’s best in a bakery is not always best in a home – be willing to vary from the rules – in the world of bread – there aren’t a lot of real rules. Time is your friend – time is your friend – time is your friend – be patient – Bread will literally make itself if you let it. It just needs some gentle guidance. No need to knead. Temperature is a primary ingredient in every loaf you make – it can be used to your advantage. A fridge and a proofer can be great aids. Shaping actually is a really important step. Gas is precious – be GENTLE!!! Your worked hard to get it – work hard to keep it. STEAM – make it / trap it – but have it. A parchment sling and oven mitts make a hot DO (Dutch Oven) a harmless utensil (no burns). Hydration is just a number – numbers in the 70s (80s for whole grains) make great bread, don’t get too worried about it. Wet hands make a BIG difference – a BIG difference. In between stiff and nicely hydrated lies sticky. Whole grain flours can add incredible flavor profiles. Finer flours always make bigger loaves. There is no hidden secret to big holes – it is, however, a combination of multiple factors all aligned – it can be elusive because of that. The only real failure is one that cannot be eaten. Bread is a mixture of art and science. Bannetons are a worthwhile investment. Rice flour is magic in your bannetons. There is no right way – there are a hundred ways – there are a few wrong ways. Bread bakers are some of the kindest sharing people I’ve met – ask questions. Be prepared for answers illustrating the hundred different ways to do something. Hang out with a fellow baker – it’s good to simply talk bread in a world full of mayhem. It can be addictive – but no one seems interested in having you stop. Share bread – it’s a gift worth sharing – whether for profit or in Kindness. ALWAYS enjoy the journey – and the bread! Hehe. I was just going to ask if you had weight measurements. I’m so OCD and like to be exact!! Thank you for this recipe, I made my first sourdough loaves this week using it. Being English I am not used to cup measures, I believe the UK cup measure is different to USA, but it seemed to work out okay. Takes a while but is well worth the effort, thank you.